Our testing of graphics cards in SOLIDWORKS 2018 wasn't all that impressive, because for a long time the CPU has been a limiting factor when it comes to graphics performance in SW. The 2019 version came out recently, though, and looks to change that story. It has a new feature which can be enabled in the System Options, under the Performance section, called "Enhanced graphics performance". Its description is pretty straight-forward: "Improves graphical performance which will scale with your graphics card." So, how much does this actually impact video card performance in SOLIDWORKS? Are more powerful GPUs actually faster now? Let's find out! This platform is built around an Intel Core i9 9900K, with very high clock speeds, to avoid the CPU being a bottleneck in this testing. That processor also gives the best possible performance in SOLIDWORKS for general usage and modeling. More than enough RAM was included, to avoid that being a bottleneck of any kind, and a super-fast M.2 SSD was used for the same reason. For the video cards, we stuck with the Quadro line this time around - covering almost all of the long-standing P-series as well as the newest RTX 6000 model. The only options changed from default settings in SW 2019 SP1 were the aforementioned "Enhanced graphics performance" mode being enabled and disabling use of "Large assemblies". No LOD settings or other graphics quality sliders were changed. To perform the actual benchmarking, I used the same basic testing we've used here at Puget for analyzing graphics performance in SOLIDWORKS in the past, just updated slightly for the 2019 release: a mix of AutoIt scripts and SOLIDWORKS macros to set the different quality settings, load the relevant model, and record the average frames per second while rotating the model. To recorded the FPS, a macro is used with a timer to rotate the model 45 degrees to the left and right for a set number of frames. From the number of frames and the total time it took to render those frames, our software is able to determine the average FPS. One note that I would like to make is that if you do not know how many triangles the models you work with have, the easiest method I know of to find out is to simply save the model as an .STL file. During the save process, a window pops up with information about the model including the number of files, the file size, and the number of triangles. It is easy to look at those last two graphs and surmise that the lower-end Quadro cards are not effective or have no place in a SOLIDWORKS workstation, but that is not the case. Remember that those are based equally on all the models and graphics modes. Further, the focus there is on relative frame rates - meaning, for example, that 200 frames per second (fps) versus 100 would be shown as a 100% increase, even though in real-world usage both would be faster than most monitors can display. 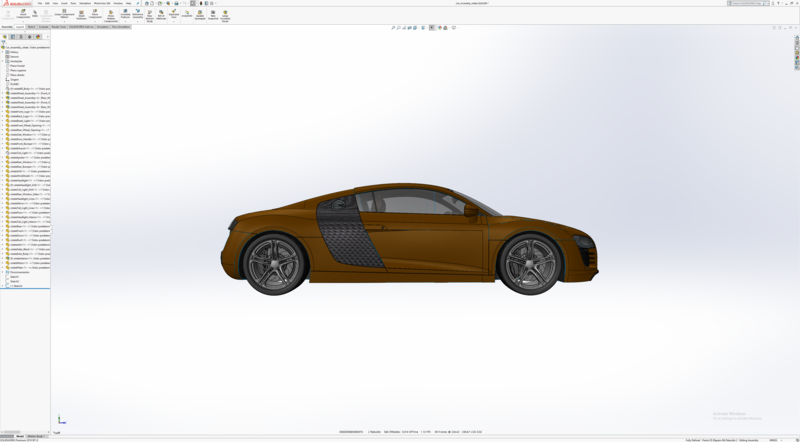 Please keep in mind that these recommendations are for SOLIDWORKS 2019 with "Enhanced graphics performance" enabled. Also, if you are going to be working with shadows and reflections a lot, consider bumping the GPU up an additional step. Another interesting thing to note is how much faster the Quadro RTX 6000 is compared to the P6000 when dealing with extremely large assemblies. When using either edges or Realview, the RTX 6000 was always at least twice as fast as the P6000 on our Tower model. I'm curious to see how lower-end cards in that series, like the upcoming RTX 5000 and RTX 4000, perform in that situation. 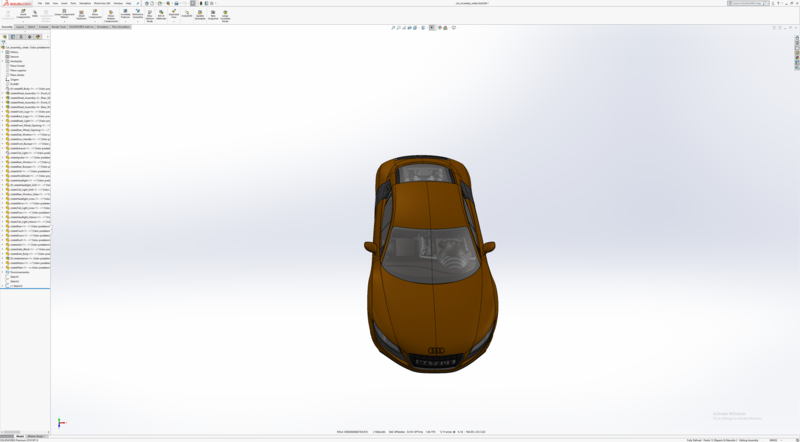 Unlike past years, with SOLIDWORKS 2019 we found a definite difference in viewport performance between video cards. This is because of improvements which the SOLIDWORKS developers have made with this version, so make sure you enable the "Enhanced graphics performance" option in Preferences to take advantage of this speed-up! The impact of this new feature is most pronounced when dealing with extremely large, complex assemblies - but even for more modest projects, it is important to select a sufficiently powerful video card. That is especially true if you use a 4K or other high-resolution monitor, which is increasingly become the norm. Hopefully the charts we provided above give you sufficient information to base a decision on, but if you have additional questions or would like help configuring a system for SOLIDWORKS check out our recommended systems below and feel free to contact our no-pressure consulting team. Thanks for the update. Will go for a P2000 in our case, that's the max I can afford on the budget along with the highest clock cpu. We will be running single ultra wide screen and the 4k performance is not too bad looking at your numbers. P2000 completely justifies its cost increase. Much better review, the charts actually scale! This is something I can show the boss now to say "See, I need a P2000!" I don't know how much you guys follow PC enthusiast/gaming website (HardOCP, Guru3D, etc); but you need to watch out for the details and fully disclose test setups. Saving to STL doesn't tell you how many triangles are in your model, it converts your model TO triangles the way I understand it. As such, you should note where your deviation and angle values are set to in the options menu when saving to .STL. It can drastically change the number of triangles in a model going from .5mm to .25mm, or 10deg to 5deg. That way we can get an apples to apples comparison to the models you benchmarked, vs what we may be using here on our own rigs. I learned to tweak those settings when exporting STL files for 3D printing. A lot of time it's not worth scaling it finer than your printers resolution, but you want to get down to AT least it's resolution, to get as much detail in your 3D print as possible. I want to see a Radeon 7 in the next roundup! ;) Some of of frag AND CAD. Interested to see how that card performs with it's 16GB HBM, and if they enabled any Pro goodies in the driver. I was interested in others test too, AMD claims this card to be more on the creative side (Blender/Davinci /Luxmark/openCL etc) . Also 16GB HBM2 1TB/s vs RTX 6/8/11GB Vram cards. So this will make the review even more relevant in near future. Is there any chance you could throw in a GeForce card for comparison like last time? I am wondering if the new graphics mode will make much difference. NVIDIA isn't happy when we directly compare GeForce and Quadro cards, especially in the context of an application like SOLIDWORKS where it is not even certified to run on GeForce (by the software developers)... and *especially* if it makes the Quadro cards look bad, though there is little risk of that here. However, I may do another article with a GeForce RTX and the Titan RTX to see how they do... and just keep the results on a separate page. I am working on SW CPU performance at the moment, so it will be a little while, but I'll see if I can fit that in. I just tried both the Titan RTX and GeForce RTX 2080 Ti, and found something interesting. With the Titan, RealView was still an option in SOLIDWORKS - so I went ahead and got performance data on that, which I will probably include in a future article (or may just post here in the comments). However, with the GeForce RTX 2080 Ti installed, RealView was no longer an option. As such, I don't think I will put that through the full test suite. Test note: both of these cards were checked with driver version 417.71 on SW 2019 SP1. It will be great to include the Titan RTX in the test, that Nvidia sell like a prosumer card, with OpenGL "unlocked" performance like in the previous Titan Xp!! I was limiting myself to GPUs that are officially on the certified list for SW 2019, and I don't recall seeing the Titan listed there. I may do a separate test with it, though, if time permits. Oh, I understand. Thank you for the reply. I was just curious about it, for CAD software in general, to see the comparison between the Titan RTX and the Quadro RTX 6000. I am talking about performance, because of course certification, stability and support are way better with Quadro cards! I ran the Titan RTX through our testing, and was surprised to find that it did allow RealView to be enabled in SOLIDWORKS! Normally that is restricted to the Quadro cards, in my experience, and trying a GeForce RTX 2080 Ti as well did indeed result in the option disappearing (as expected). As far as performance goes, though, the Titan was quite disappointing. The performance was far lower than the Quadro RTX 6000, which has similar specs, especially when "with edges" was selected. Still, frame rates were high enough on the smaller assemblies that I think it would be just fine... the one place where it really struggled was with the massive Tower Bridge project, where it got only around 10fps at 4K resolution with edges. Without edges the frame rates were still lower than with the Quadro, but certainly high enough to be functional. Thank you very much for this test! So, I'll go for an RTX 5000! So I just upgraded to 2019 SP1. I enabled this new graphics setting. No duh it's faster. AA appears completely broken, and doesn't work, even if forced in the graphics driver. Anyone else seeing this? Oh, and Radeon 7 is getting a Radeon Pro driver release, and you will be able to switch from Adrenaline (gaming driver) to Radeon Pro driver on the fly. I hadn't even thought of that possibility - I will try to look at image quality with the setting on vs off, but I am not an engineer by trade and may not be qualified to judge what looks correct or better based on the needs of real-world designers. Also, if I may ask, what video card are you using? I did some comparisons, in case these help. All were taken on a Quadro RTX 5000 (a card which we got a sample of after I had already finished this article) and on normal (not Realview) to try and make it easier to see differences. I think I like the look of the ones with the Enhanced Graphics Performance enabled better, but neither seems to have much AA going on (and I didn't try to force it on in the drivers or anything). I should also note that, with the above video card (RTX 5000), performance was at minimum 35-80% faster with the Enhanced Graphics Performance option enabled. In some tests, it was several times faster - but in those cases it was something like 100fps vs 300fps... and at that point, there is no practical difference. Where the difference would be noticeable, in cases below 100fps, that 35-80% speedup is pretty substantial! Check the radio box in SW system settings under "Display" for Full Scene Anti-aliasing" and try it again. Or is that already on in all these benchmarks? At the moment I have our SW 2019 license installed on a system with the Quadro P6000, and looking in System Options -> Display -> Anti-aliasing I see three options: None, Edges/Sketches Only, and Full Scene. However, Full Scene is greyed out for me. It is currently on Edges / Sketches Only, and as I haven't touched the option myself I assume that is what SW 2019 defaulted to on installation. I wonder if some other setting I have enabled is keeping the Full Scene option from being available? I am on a newer driver revision than what SW lists on their certified page (412.16 vs 411.63) so I could try rolling back to the older version if you think that is the cause. Have you had to do anything special on your system, with the K620, to enable Full Scene AA? Nevermind - Turns out you can only change to Full Scene AA when no files are open. Found that info online, and sure enough with all projects closed I could change it. And it does indeed look better at 1080P! I am going to run some testing now to see if that has much impact on frame rates in our tests. Some stuff online indicated that FSAA in SW only applies when the assembly is sitting still, and that as soon you start to rotate it that gets turned off... so if that is correct, we should see no difference in FPS. And it looks to me, with "Enhanced Graphics Performance" (EGP) beta ON, FSAA isn't being applied when the model is static. It appears to kick on when you rotate/pan/zoom. And I don't think that's true..it sure looks good when I rotate here, the jaggies only show when I disable it or turn on EGP (static). I just finished running our full SW graphics test on a Core i9 9900K with Quadro P6000 - the same platform / configuration as used in the tests in this article - with FSAA enabled. Performance was slightly lower, but not much. In places where the frame rate was already absurdly high, in the 100s of FPS, there was a 10-20% drop... but it was still very high. In the more demanding parts, especially the massive Tower assembly, the loss in performance was only in the 1-3 fps range (from 35 to 33fps in 4K Shaded with Realview & AO, for example). So really not much impact, at least with this powerful of a card. However, as you noted, I can't see any difference between still screenshots of assemblies with FSAA, Edge AA, or No AA. I'm not even sure if I see the effect of FSAA when rotating or moving a model... it does seem a little smoother around the edges when doing so, but I can't tell if it is really AA or if it is just the visual effect of the object moving that makes it look less jagged. I just have a K620. Corei7 6700 w/ 16GB ram. Somethin' fishy going on for sure. Hopefully I'm just missing a setting, but, unchecked the box and back to work. I was so excited to use this feature in SW19 as I have a P6000 and a 4k 144h monitor and deal with very large files. Turns out it's blazing fast, I went from 5-10fps to around 200fps. Clicking and selecting faces doesn't lag either for large files. Problem is it crashes constantly. Everytime I isolate a component in a large aessmbly, SolidWorks crashes. I can't use it. Oh my! I didn't do much in the way of usability testing, I was just focusing on performance of whole assemblies. I'm sorry to hear that it is giving you trouble! What Paul and Alan are saying is true. The new Rendering Pipeline is still considered beta functionality, and even with SP2 it is still considered beta and there are quite a few issues to be worked out still. It's best to use as a preview of upcoming technology but NOT to be used in production on a day to day basis. Still awesome technology if you have higher end GPUs or 4K and big assemblies. Do y'all think it is worthwhile testing this mode still, or would it make more sense to hold off on SW graphics testing for now? We already know that the old pipeline basically had little to no performance difference between various Quadro cards, but if that is still the way to go for real work then showing the wider performance spectrum of the new pipeline could be misleading. I was about to start in on an article covering the whole of the new Quadro RTX series (4000, 5000, 6000, and 8000 - we finally have them all here in Labs). Perfect timing since SWX just released certified drivers for all the RTX cards as well. I'm definitely interested because it will come out of BETA eventually. Maybe just go with a disclaimer on the beta status.